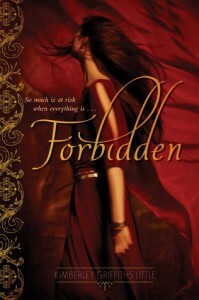 Forbidden by Kimberley Griffiths Little was a tale that I was totally and completely absorbed in. The details, the characters, the storyline…everything! And with an ending that left yearning for what’s to come next, it’s without a doubt that this book is high up on my “must read” books of 2014. The story follows that of main character, Jayden. A sixteen year old girl who is the daughter of a poor family who must travel through the desert from summer to winter and back. But this year is different for Jayden, for this the year she becomes betrothed to Horeb who is next in line to rule their tribe…where she will become a princess to these people. But Horeb is not the same “cousin” she has known all her life. He has become more harsh, calculating, and not as honorable as she once thought he was. If she could change the path her life is headed, she wouldn’t marry Horeb for she knows deep in her soul that life with him would be miserable and perhaps violent. On the day where she and her tribe must pack up their tents and travel to a new destination, so much tragedy befalls her and her family. And how heart wrenching was it to read? So much emotion and detail that one can’t help but swept up in this great moment of loss. And from this loss, a stranger happens upon Jayden. A stranger that will forever change Jayden’s life. This amazing, generous man is Kardesh, and omg how he made me swoon. His sweet demeanor, the way he holds himself and acts is so crush worthy. And how he speaks and treats Jayden was what solidified him as a book boyfriend. Even in the face of evil and danger, he is still so sweet and endearing. As Hardesh travels with Jayden and her family, a sweet relationship starts to build and it is one that I loved watching unfold. And I’m positive that you will adore it as well. I love stories of first loves, and this is one that I gobbled up. The ups and downs and this couple goes through is one that readers will remember, and crave to continue. Every character in this book jumped out at me. It really was as if a movie was playing out in my mind, and I didn’t want the ending to come. Unfortunately, it came all too soon. I came to totally abhor the character of Horeb, which enthralled me all the more. Where would this evil monster come and wreak havoc on our star crossed couple? Every turn of the page had me hoping against hope that he would never cross their path. I can’t even begin to think about what life would be like if I were forced to have to marry a man that I could not stand. My heart went out to poor Jayden and the terrible life ahead of her. The only salvation? My desire to see Hardesh in the pages. Seriously, I could not get enough of that character. I hated Dinah and her selfishness. I couldn’t stand that the other tribe mates were so blind towards who and what Horeb really was. Jayden’s sister, Leila, pissed me off so much that I wanted to throw the book down and fume. It’s the fact that the author was able to bring all these different emotions out of me for these characters is yet again, another reason that this book kept my attention. I was totally and utterly swept up in all the drama. The author’s description of the hardship of crossing the hot, barren desert was so well done. I could almost feel the heat of the sun, and the discomfort of the sand and dirt. I could feel their need for the next water well, and just how dire their situation is turning into. The ending was fantastic, although, predictable, but I didn’t care. 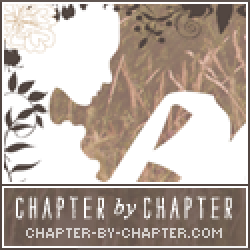 I cannot wait to see what author Kimberley Griffiths Little has in store for these characters, and where this story will lead. I have my guesses, and I really hope they’re wrong because I don’t know if my heart could handle it! (Yes, it’s not a happy ever after that’s going on in my head unfortch). Fans of reads set in ancient Mesopotmia will fall head over heels for Forbidden by Kimberley Griffiths Little. It’s a story that will leave you breathless and heartbroken and hopeful.